According to mythology, the Nemean Lion named Leo had a reputation of terrorizing and preying upon people to satisfy its appetite. This man-eating beast was indestructible as weapons comprised of bronze, stone and even iron could not penetrate its skin. But the lion was no match for the mighty Hercules who strangled Leo and placed him in the night sky to show off his conquest. Although the story may sound scary, Leo is actually a marvellous constellation with many interesting objects for locate and enjoy. At a little less than 1,000 square degrees, Leo ranks 12th largest constellation in size. Leo is easily recognized especially now that brilliant planet Jupiter is still located within its south east quadrant. Another way to find Leo is to first locate the Big Dipper that looks like an ordinary kitchen pot. Now imagine the pot had a hole in it, water would pour directly onto the lion’s back. 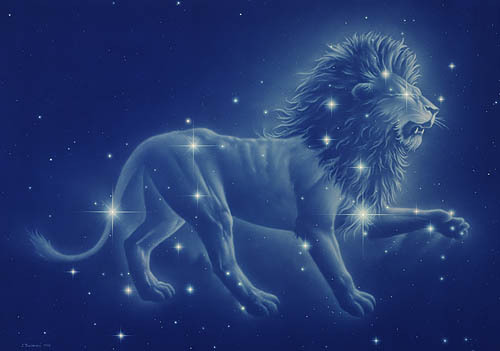 Leo’s head is symbolized by a sickle or backwards question and comprised of six stars. At the base is the bright star Regulus. Shining at magnitude 1.35, this spectral class B7 “main sequence” star is located 77 light years from us and is some 360 times brighter than the Sun. It spins extremely fast, 317 km/sec at its equator and causes the star to bulge and looks like an oblate spheroid. 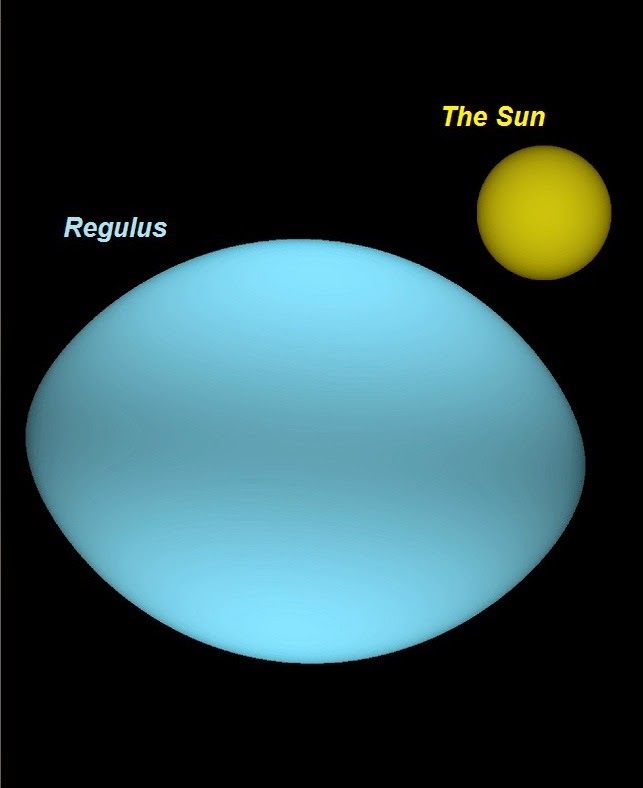 It takes a mere 16 hours for Regulus to complete on revolution compared to the Sun’s 25 days at its equator. 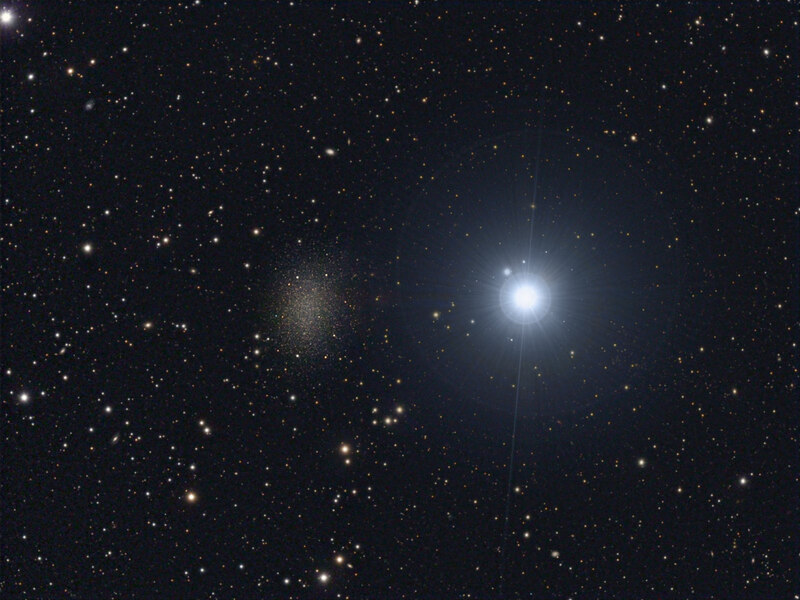 Point your telescope to Regulus to locate the faint galaxy called Leo 1. The secret to success is to move the brillant star just out of the field of view. You should see a smudge of light from this dwarf galaxy. Leo 1 is part of the Local Group of galaxies and thought to be one of the most distant satellites of our Milky Way galaxy. Speaking of galaxies, the constellations of Leo and Virgo are strewn with an large number of galaxies to which many pairs or groups can be viewed through a wide angle eyepiece. A classic grouping is the Leo Triplet which consists of M65, M66 and NGC 3628 and resides some 25 million light years from us. NGC 3628 is also nicknamed the “hamburger galaxy” because of its shape. Also known as the “M66 group”, these three spiral galaxies located between the stars Chertan and 78 Iota Leonis, are interacting with each other by gravitationally forces. This is quite evident in M66 and more so in NGC 3628 in which photography brings out the subtle disturbances in these two. Very long exposures show the extremely faint tidal tail branching off NGC 3628 that is thought to be 300,000 light years long. 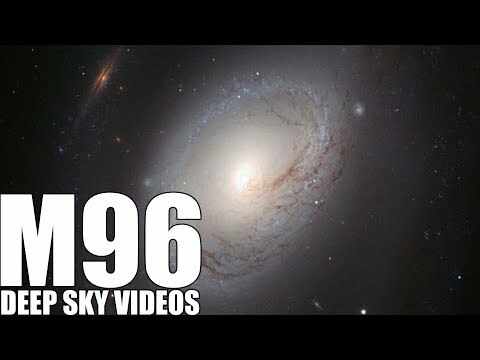 Another fantastic view is M95, M96 and M105. Dubbed the M96 group, these members are about 38 million light years away. Unlike the M66 group, these galaxies are different in appearance. 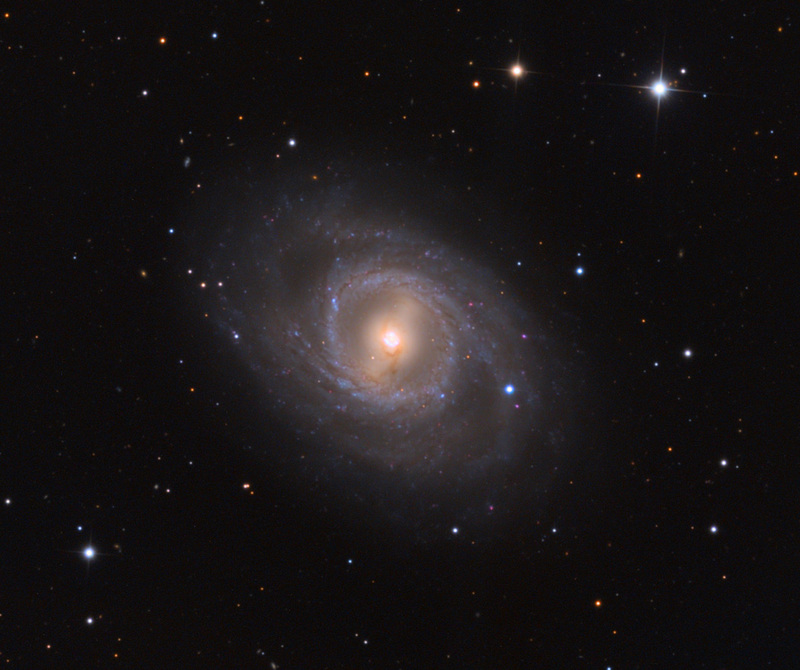 M95 is a barred spiral with an almost circular galactic ring. M96 has asymmetric arms as well as a displaced core which is a tell tale sign of gravitational forces from the other two changing its shape. And finally M105 is an elliptical galaxy with no arms. The M95 group is located halfway between Chertan and 47 Rho Leonis. 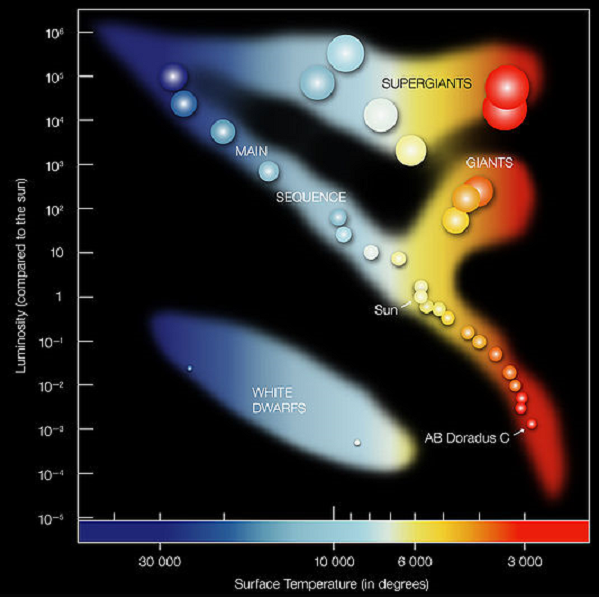 As we move to Virgo, we are greeted with the challenge of locating more than 100 galaxies. There are far too many to mention in this article but one of the most striking sights is the “Markarian chain of galaxies”. 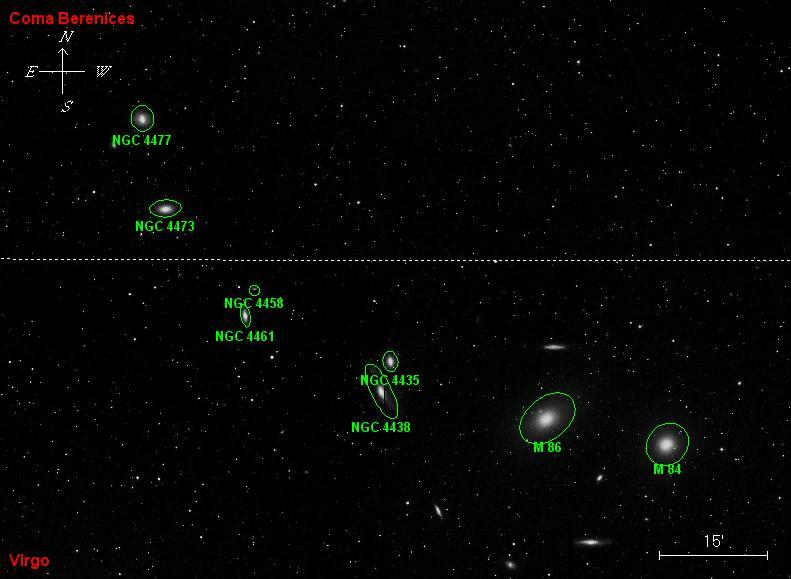 As the name suggests, a wide angle photograph will reveal some eight galaxies in a line with a dozen overall in the frame. 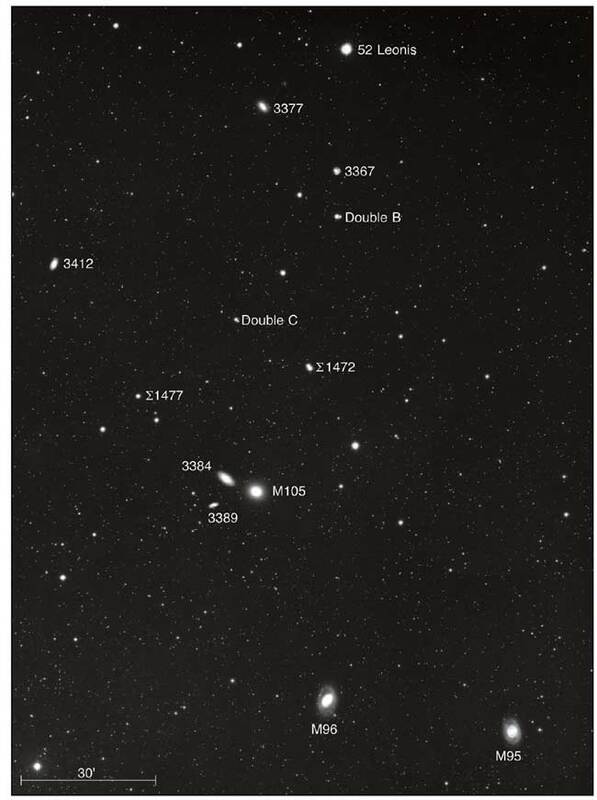 The far right side of the chain ends with M86 and M84. Just before we get to the end, we see NGC 4435 and 4438 commonly referred as “The Eyes”. Here we see two galaxies interacting together and ranging in distance from 44 to 55 million light years away. By far the highlight of the month of May will be the daytime transit of the planet Mercury across the disk of the Sun. This event was last seen in 2006 and will not repeat until Nov 11, 2019. Canada is set for the prime show and will see the entire event. First contact occurs at 11:12:19 UT. Mid point of the transit happens at 14:57:26 UT with the fourth and final contact at 18:42:26 UT. Extreme caution must be taken whenever dealing with the Sun. Telescopes must use dedicated solar filters and not home made techniques. Many observing sessions are being held across Canada. If you do not have a telescope or a solar filter, contact you local astronomy group or Centre on their activities for this event. The Eta Aquarid meteor shower generated from Halley’s Comet, peaks on the night of May 5/6. With the constellation being low in the south sky, this show is best seen in the USA with an estimated 20 to 40 meteors seen per hour. Unfortunately about 10 per hour are predicted for mid-north latitudes. The good news is no moon will interfere. On May 1 the planet Venus is a mere nine degrees from the Sun and now getting dangerously close as it swings behind our daytime star. You should not attempt to scan for the planet with a telescope or binoculars. On the other hand, you will not have any problem locating the planet Mars. The brilliant orangey coloured disk is above the south east horizon. The much fainter star Antares also sporting an orange tinge is directly below Mars as they crest the horizon. Some 20 minutes later, the ringed planet Saturn can be seen to the lower left of Mars. The Red planet is at opposition on May 22 and will be closest to Earth on the 30th. On the 21st, the full Flower Moon will be the smallest of 2016.